Bandar Sunway, 29 March 2017 – The Sunway Oxbridge essay competition aimed at improving English proficiency in Malaysian schools is back this year. Secondary school students, aged 13 to 17 from public and private schools using the Malaysian syllabus, are invited to submit original English essays on “Climate Action” online from April 1st to April 30th (1.00 pm), and stand a chance to win Sunway Bursaries worth RM190,000 and cash prizes worth RM28,000. Endorsed by the Ministry of Education, the essay competition is in its fourth year and has received more than 8,000 entries in the last three years. The competition focuses on taking action to combat climate change, which is listed as one of United Nations Sustainable Development Goals (SDGs). This year’s competition is in line with Sunway Group’s sustainability efforts and adoption of the SDGs following the establishment of Jeffrey Sachs Center on Sustainable Development (JSC) at Sunway University. The JSC was established with a USD10 million gift by the Jeffrey Cheah Foundation, Malaysia’s largest education-driven social enterprise, and in partnership with the United Nations Sustainable Development Solutions Network led by Professor Jeffrey D. Sachs, who is a world-renowned economist and champion of sustainable development. “Sunway is committed to the United Nations Sustainable Development Goals. This year’s English language essay competition is an ideal platform to promote awareness and improve education at an early stage so that our young learn to take charge of the need to combat climate change and its impact,” said Dr Elizabeth Lee, Senior Executive Director of Sunway Education Group and Sunway University. “The Sunway Oxbridge Essay Competition is an opportunity for schools, parents, and teachers to work together as a community to inspire the young to share their ideas and opinions on climate action,” she added. Once online submissions are closed, the judges will select the eligible students for the final stage of the competition, which requires the shortlisted students to sit for an on-site essay assessment on 10th June 2017 at various locations nationwide. Winners will be announced on 23rd June 2017 via website and email. In each category, the winner will take home RM5,000 cash and a Sunway bursary worth RM20,000, the runner-up will win RM3,000 cash and a Sunway bursary valued at RM15,000, and the second runner-up will take home RM1,000 cash and a Sunway bursary worth RM10,000. Each category will have ten consolation prizes, comprising a cash prize of RM500 and Sunway bursary of RM5,000. 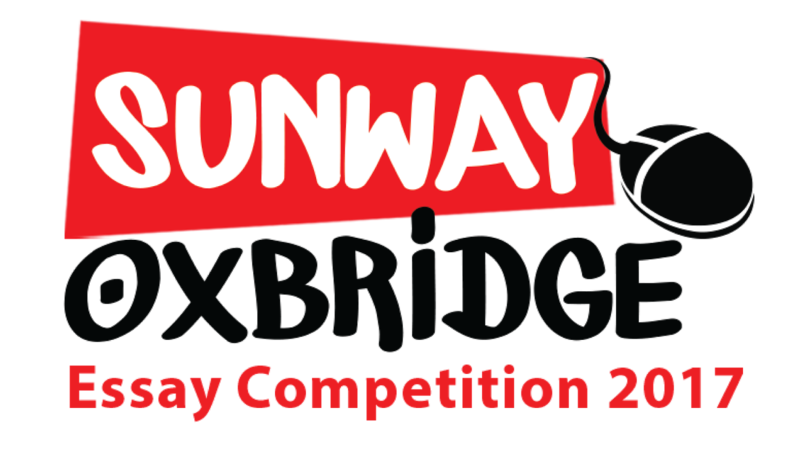 To encourage student participation in the competition, a special prize will be awarded by Sunway to the school with the most submissions. The essay competition is organised by Sunway Group, The Oxford & Cambridge Society of Malaysia, Jeffrey Cheah Foundation, Sunway University and Monash University Malaysia. Sunway Group was established in 1974 and is one of Malaysia’s largest conglomerates with core interests in property, construction, education and healthcare, with a unique build-own-operate business model. With a combined market capitalisation of approximately RM 13 billion, our FTSE4GOOD public-listed entities form a real-estate value chain that assure our communities sustainable growth. Our 15,000-strong team across 50 locations worldwide is committed to delivering transformative growth and sustainable progress through our 12 business divisions - property, construction, retail, hospitality, leisure, healthcare, education, commercial, trading and manufacturing, building materials, quarrying and Real Estate Investment Trust (REIT). The Oxford & Cambridge Society Malaysia was registered in 1960 with Tun Sir Henry H. S. Lee as its first President. The Society promotes social, recreational and cultural activities in Malaysia between past and present members of the two Universities and holds an annual celebration dinner of the Oxford and Cambridge Boat Race. In addition to hosting talks for members by prominent Malaysians and visiting Oxbridge personalities, the Society encourages and supports the use of English by Malaysian schoolchildren through an annual English Language Event and an annual Debating Forum. As part of Sunway Group’s corporate social responsibility (CSR) efforts to improve the quality of education in Malaysian schools, Sunway Group initiated the Sunway English Language Development Programme with the commencement of the English Tutorial Programme for the Form 4 students of SMK Bandar Sunway in 2013. Partnering with Jeffrey Cheah Foundation and Sunway University, the English Tutorial Programme is designed to improve English language speaking proficiency and address the challenges of learning English in the national school curriculum. These students are also encouraged to participate in the annual English Public Speaking Competition organised by Sunway, a culmination of the English Tutorial Programme, to instill confidence among students to converse in English and improve their public speaking skills. Sunway Group also initiated the annual Sunway-Oxbridge Essay Competition aimed at elevating the standards of education and English proficiency among students. The competition is jointly organised by The Oxford & Cambridge Society Malaysia, the Jeffrey Cheah Foundation, Sunway University and Monash University Malaysia. Education is one of the three pillars of Sunway’s CSR initiatives which also include Healthcare and C.A.R.E. (Community Aid, Reach-out and Enrichment) projects.